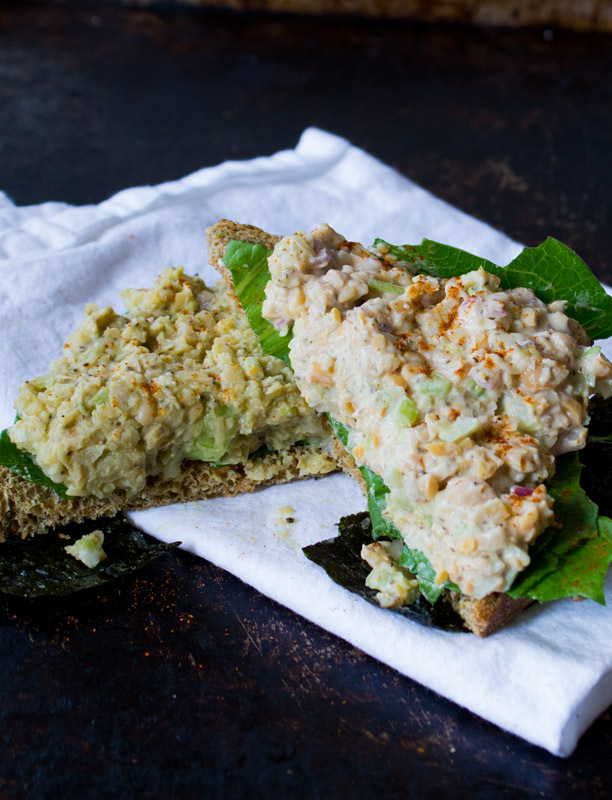 I say it out loud every time I eat chickpea “tuna” salad. 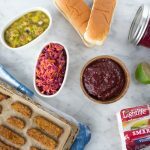 This is an absolute perfect summer recipe for any occasion, from daily lunches, to beach picnics, to a Forth of July cookout. What’s better, it only takes a few minutes to make! MmMmMmmmm. I’ve never been a fan of processed faux seafood products. Yet, I’ve found that by using whole plant-based ingredients in place of highly processed ones, fakin’ vegan food is so much tastier and more fun. Sure, I could go to the store and pick up some vegan “fish”, but what’s really in that? Could it be any healthier than opening up a can of chickpeas? Probably not. Using whole plant-based ingredients, like chickpeas, to replicate animal based dishes isn’t as creepy, and it’s so much better for you. Have you seen my vegan “crab cakes”? Boy… I used to L.O.V.E crab in every form, but I’ve seen the light. I truly believe this vegan stuff is just as good, if not better. On the left vegan chickpea “tuna” with vegan mayo, and on the right with avocado. 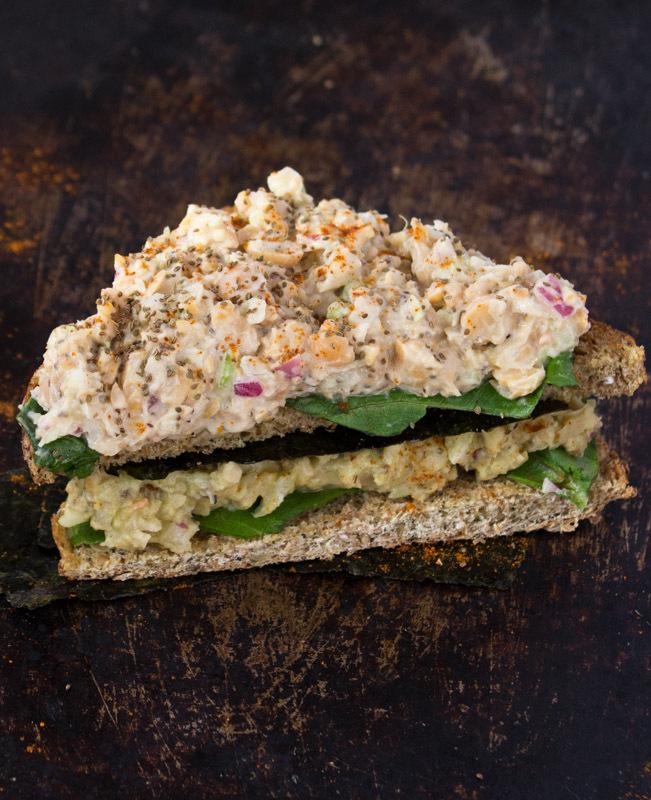 In the video I made this chickpea “tuna” salad using vegan mayo. However, if you are avoiding added oils (mayo is a blend of oil), you’ll have great results using creamy mashed avocado. The flavor is a little milder, but equally as delightful. To really take it to the next level, enjoy the salad on toast (I used sprouted rye bread with dill and caraway seeds), with some romaine lettuce, and a few sheets of seasoned nori. 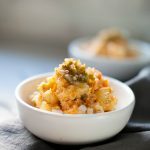 If you do plan on making this for a party or cookout, make sure you at least quadruple the recipe. Folks are going to be all over this one. I recommend Ume plum vinegar is a very special ingredient made with Japanese plums. It has a distinctive flavor, so I don't recommend substituting a different vinegar for this one. Do what you must to get your hands on it (though that really should not be difficult). I buy Eden brand ume plum vinegar at Whole Foods. You can also find it online. This ingredient is very salty, which is why there is absolutely no added salt in the recipe. Use salt-free beans. If you only have beans with salt alredy added reduce the amount of ume vinegar you use. 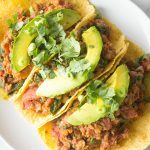 Don't have a food processor yet? Go get you one!! Place the chickpeas, Just mayo, mustard, ume vinegar, celery seeds, celery, onion, black pepper, and cayenne pepper into a food processor. Pulse a few times until incorporated and minced. Careful not to overblend. You shouldn't be pulsing more than 20 seconds. 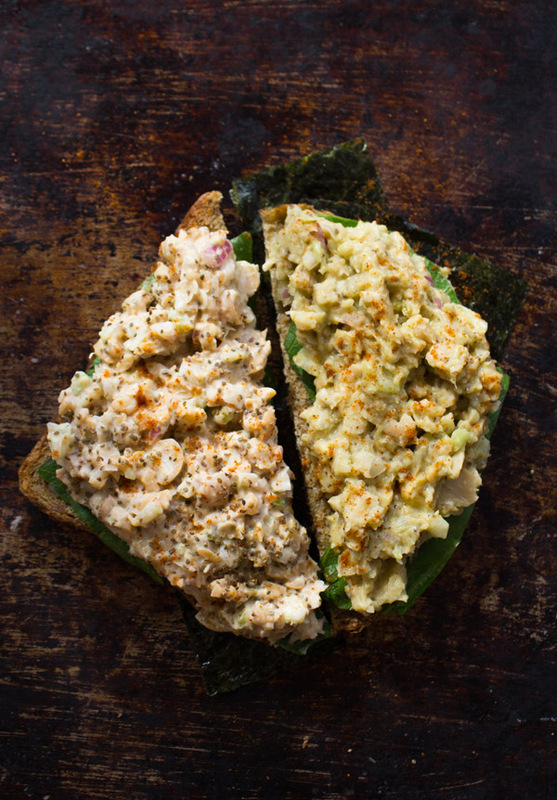 Serve over toast with romaine lettuce and nori.